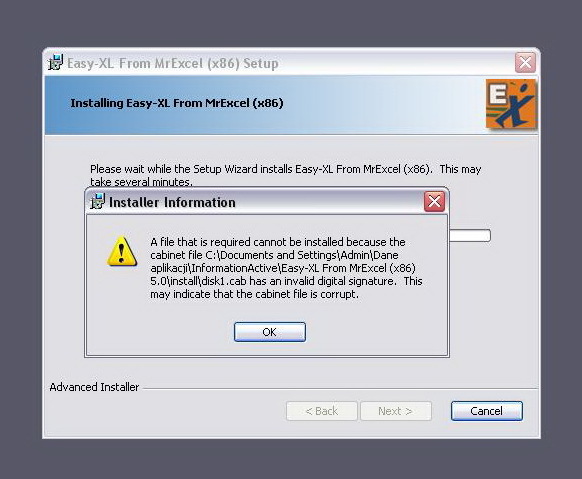 I download Easy-XLx86.exe and can't install this add-in in my computer. I have Win XP Pro SP3 with .NET Framework 4. The same installer work perfectly on another machine (with Win XP Home SP3). I spacial format my disk C and try install on clean system, unfortunately with the same result. Is the computer connected to the Internet when you run the installer? If not, Windows may not be able to validate the digital certificate. Problem solved. I run installer offline.